Versace was born in Italy in December of 1946. He started as an apprentice at his mother’s business as a dressmaker and then started working for himself as a freelance designer. When he was 25 he started creating collections for some of the top fashion houses including Callaghan, Complice, and Genny. Along with his brother, he founded the Gianni Versace company in 1978. He debuted his first women’s collection in Milan that very same year. This first debut was a major success and Gianni Versace spent the next many years designing clothing for both men and women. Versace also spent many years designing costumes for several different theater groups. Over the years, he has won several awards for his designs. Recently, the company started selling perfume for women and colognes for men as well. Versace men’s cologne comes in many different scents, all of which are manly and sophisticated. These colognes offer hints of citrus, floral, and wood. Most men will find a Versace cologne available that will suit their needs. Most of the colognes available from Versace are fairly reasonably priced, making them suitable for just about every type of budget. This Versace fragrance comes with an aquatic touch which offers instant freshness and makes you feel confident. The zesty essence reminds you of summer and sunshine, and the woodsy note adds to its subtle elegance. People, who fit the compliment of being ‘cool’, would really love this smell. It is perfect to wear at a beach. 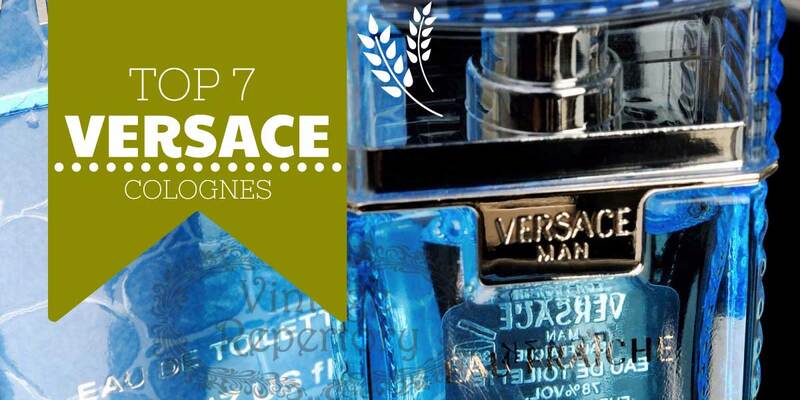 VERSACE MAN EAU FRAICHE is the most popular products among all top colognes of Versace and its scent has an acceptable amount of longevity and sillage. Top Notes: Lemon, Rose, Rosewood, Bergamot. Middle Notes: Cedar, Pepper, Sage, Tarragon. Base Notes: Amber, Musk, Saffron & Woodsy Notes. If you are currently looking for a perfume for casual wear, you may want to opt for this Versace cologne. It comes with a clean and sweet fragrance and smells like summer. Spraying this fragrance will give you the enthusiasm you need for a long day at work. It happens to have a generic touch, like the day wear colognes that so many women love. Versace Pour Homme is on the softer side, which is why you’d probably have to add a couple of more sprays of it than you would with other colognes. However, the notes blend in some of the finest and uncommon aromas, perfect for everyday wear. Top Notes: Neroli, Bergamot, Bitter Orange Leaves, Citron of Diamante. Middle Notes: Geranium, Cedarwood, Clary Sage, Blue Hyacinth. Base Notes: Musk, Tonka Bean, Mineral Amber. If you are looking for the manliest cologne of this brand, you’d have to purchase Eros by Versace. This cologne was inspired by Greek mythology and is named after the son of goddess Aphrodite. The smell reveals unconstrained passion which heightens desire. Eros belongs to someone confident about whatever they do and can gracefully accept failure if they have to. The perfumer had proclaimed that this cologne comes with a blend of fresh, oriental and woody essences. This product is yet another summer wear, but you can carry it for all occasions – from work to romantic dates! You’d also like to know that Eros has been reviewed to be long-lasting and have quite a heavy sillage. Sadly, it is not recommended for men who don’t like strong fragrances with fruity highlights. Middle Notes: Tonka Bean, Geranium, Ambroxan. Base Notes: Atlas Cedar, Virginian Cedar, Vetiver, Oakmoss, Madagascar Vanilla. Dreamer by Versace is a cologne for romantic souls. Painters, artists, writers and readers or any other person wanting to showcase the intellectual side of their personality. It starts off with a sweet touch and ends with warm woodiness. This can be worn with casual wear and is ideal for winter weather. If you’re into a long relationship, and you want to bring back the days of romance and intimacy, then this cologne may be a new beginning for you! It has been reviewed to have a long lasting essence with a high sillage. Which makes it perfect for men who love stronger fragrances. Top Notes: Clary Sage, Mandarin, Lavender. Middle Notes: Rose, Tobacco, Geranium. Base Notes: Tonka Bean & Cedar. Blue Jeans by Versace is a casual wear cologne and is classified to be sharp, Oriental and woody. It is perfect for someone who wants an all-in-one fragrance and to feel like he’s using a cologne that will maintain his potency. The blend of citrus and wood makes it slightly more masculine and really adds to a man’s personality. The middle notes are spicy and followed by a warm dry-down. You can buy this for daytime wear and it is acceptable for all seasons. It goes above average in terms of longevity but has only a moderate sillage. However, as you get a mixture of several essences in one perfume, it’s hard to place in any specific cologne genre. Top Notes: Bergamot, Anise, Basil, Lemon, Pallisander Tree. Middle Notes: Rose, Lavender, Geranium, Sage, Jasmine, Heliotrope, Lily. Base Notes: Musk, Sandalwood, Iris, Patchouli, Tonka Bean, Vetiver, Amber, Vanilla. Oud Noir Cologne by Versace is a good pick to make a good first impression. The fragrance reflects the essence of pure masculinity and makes it unforgettable for people with a strong sense of smell. The impact of the woody notes come with a smoky feel, and is perfect for someone who wants to make the best first impression possible! It comes with a spicy touch, which gives you what you crave. There are no distinctive notes, and the product has a blend of oud, leather, woods, spices and Oriental essences. If you want a perfume for parties and clubs, this could be a nice option. The aroma brings in the opulence of leather and combines it with the earthiness of Agarwood. The Oriental and woodsy notes build up the spice and make it last a long time. However, the product might be excessively strong for men who aren’t used to a heavy sillage. This sharp and woody fragrance had become one of the classic products made by Versace. It was introduced in 1986 and has a long heritage. The product can be kept handy for casual events and dinners. It is reviewed to last an acceptably long time. It leaves a moderately heavy sillage and is perfect for pleasant temperatures. Whether you’re old-school or you like to simply step back in time, this could be a product that complements your distinct personality. However, it should be noted that Versace L’Homme is probably not perfect for over-enthusiastic individuals and go-getters. Top Notes: Lemon, Petite Grain, Pimento, Basil. Middle Notes: Cinnamon, Cedar, Sandalwood, Patchouli, Rose. Base Notes: Leather, Oakmoss, Vanilla, Labdanum, Tonka Bean. Which one are you talking about? Thereare so many. What was it called? I love the fragrance of Versace Man Eau Fraiche! Very soft and hard to forget once you wear it and use it in your body. This one is what I recommend and miss with Versace Fragrance Perfume. It’s simply Amazing! With a crocodile skin looking black box? Which one would you recommend for a teenage boy? Thanks. Versace Eros is very good for young guys. Pour homme would be great for a teenage boy. Eros is more of a suite and tie smell. My son’s favorite is Versace Pour Homme. Light blue bottle witha silver medalion on the front. He is 17, very nice, subtle scent. I will suggest you go with Versace Eros because its fragrance is of next level. It is kind of for everyday use and for party use. But you must try at least once… and buy it from genuine stores for a genuine product. Dylan Blue is the best by far! I use Versace L’Homme and found this one the best for far. There are also Arabic brands for men perfumes like Ghawali.